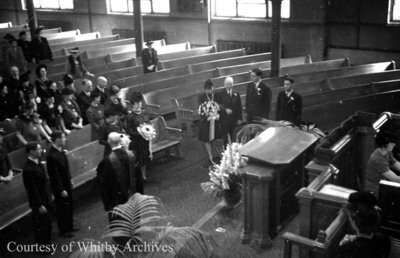 A black and white negative of a wedding ceremony inside a church. In this view the bride is being escorted down the aisle by an unidentified man. The negative envelope refers to the wedding as the Bird wedding. The other name on the envelope is illegible. Bird Wedding, c.1940, Marjorie Ruddy. Whitby Archives A2013_040_697A.